Visiting the largest pyramids discovered in the world so far in Bosnia Herzegovina can be an experience of a lifetime. Dr. Semir “Sam” Osmanagić, the archeologist who discovered the pyramids is unearthing amazing discoveries that will affect how we view human history, energy production, healing, water purification, and much more. The site, about 21 miles northeast of the capital of Sarajevo in the town of Visoko, is a complex of structures spread over several miles that includes pyramids, a large cone-shaped mound called a tumulus, giant stone spheres 10 to 15 -feet in diameter, and more. Since 2006 Dr. Osmanagić and a team of engineers and scientists he assembled have been taking various measurements, collecting data, and analyzing it to show that what he has found are indeed energy machines that are far different than surrounding mountains. People are going into tunnels excavated under the pyramids, drinking primoridial waters found inside the tunnels and around the pyramids, and coming out healed of major illnesses, including stage 4 lung cancer, Parkinson’s disease, and many other issues. But this article is about travel tips for those interested in visiting Bosnia and nearby Croatia. Both are some of my favorite places in the world, and I will be going there again to speak at the Bosnian Pyramid Conference in June, 2019. There are lots of magnificent places to visit in Bosnia and southern Europe, but I will limit my recommendations to places I have been within driving distance to the Bosnian pyramids for those who may be interested in some side trips after visiting the Bosnian pyramids. I’ll include travel tips that will help, especially Americans, to have a better time when visiting the area. There are MANY beautiful and amazing sights to see all around southern Europe, but outside of Bosnia, I have spent most of my time in Croatia and Montenegro, so I have some recommendations for first-time travelers who want to see some sights outside of Bosnia. 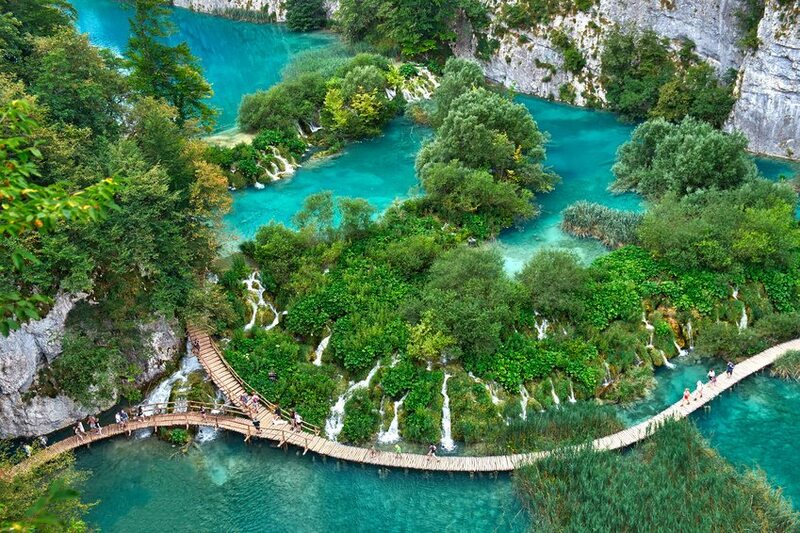 Plitvice is “Croatia's Grand Canyon,” an incredibly beautiful and peaceful place to get out in nature. June through August is peak tourist season, so there are lots of tourists there, but it's still very much worth seeing, and you can meet people from all over the world there. You can rent beautiful cottages on Airbnb.com in the Plitvice area. Plitvice is a relaxing, beautiful 5-hour drive from Sarajevo through the country, with magnificent green rolling hills and mountains along the way. You'll need your passport and rental car papers to cross the border into Croatia. Split is a beautiful and easy 3-hour drive from Plitvice and a 4-hour drive from Sarajevo. Split is my favorite place in the world to visit. It's a medieval town situated around ancient Roman emperor Diocletian’s summer palace on the Adriatic Sea. The palace is on a giant plaza on a waterfront bay with lots of great restaurants and shops built into the palace. The many rooms that used to house Diocletian and his militia are now a fascinating maze of shops, restaurants, and hidden plazas. There is lots of nightlife with many shops and restaurants open past midnight. You can spend days just touring around the town and palace, eating great food, and visiting many eclectic shops. Zagreb is a beautiful ancient city with lots of things to do and see, lots of nightlife. It’s about a 5-hour drive from Sarajevo, Bosnia. There are many beautiful, unique, and amazing sights along the Adriatic coast. Among them, Zadar, Dubrovnik, and the many islands along the coast are awesome destinations. If you have the time, you can take cruises along the Adriatic coast to see various ports. Dubrovnik has magnificient apartments for rent on the mountain overlooking the Adriatic and Dubrovnik’s ancient castle city, now a tourist shopping mecca. Next to Plitvice and Split, this is my favorite destination. Bosnia and Croatia are developing countries and A LOT of people smoke there, between 25 and 40% of people depending on location, so you'll be exposed to cigarette smoke in most public places whether they claim to be non-smoking or not. Hotels and restaurants are notorious for people smoking in non-smoking areas including in guest rooms, so it's better and cheaper to get Airbnb rooms rather than stay in a hotel room. Plus with an Airbnb place you can have a kitchen to make food. The ubiquitous smoking in Europe is probably the most difficult part to adjust to for American nonsmokers, so be prepared. If you protest smoking near you, you’ll likely be the one considered rude, so adapt and avoid as best you can. Food in Bosnia and southern Europe is heavy on meat, eggs, bread, and dairy. If you're vegan or vegetarian, options can be limited outside of bigger cities like Sarajevo or tourist towns along the Adriatic Sea. There are good produce stands and stores all around in the late spring through early fall. You can use the HappyCow.net web site and phone app to find vegan, vegetarian, and healthier food options when traveling, even in Bosnia and Croatia. I also hit the produce stands and neighborhood grocery stores to make my own food, and there are plenty of fabulous vegan and vegetarian options in Split, Croatia, including a macrobiotic cafe. GMOs are banned in Bosnia and Croatia, so you don't have to worry about that wherever you go. but once you find a flight there, it's best to book the flights through the airline web site so you don't run into complications, especially when using multiple carriers. I have had to transfer checked bags myself from one airline to another when booking through 3rd party sites like Kayak.com, etc. because they’ll sometimes make multi-carrier flights between airlines that aren’t partners. Dragging heavy bags through the gigantic airports in Europe and Turkey can be a royal pain. Another web site to find cheap flights is kiwi.com, but personally I recommend NOT using it or sites like it unless you’re the kind of traveller willing to put up with difficulty and possible delays, expenses, and heartache. Kiwi has some very inexpensive flights, but be warned, they’re cheap for a reason! They show discount airlines that have horrendous on-time records, cramped seats (torturous on an 11-hour flight), multiple carrier legs that have horrible connection success rates (which can delay you by a day and cost you hundreds of dollars), crazy routes with long bus rides from one airport to another to make a connection, very low baggage size and weight limits, and airlines that nickel and dime you for EVERYTHING, from food on an 11-hour flight, to baggage, etc. etc. Some of these may seem innocuous on the surface, until you miss a connection and find out it will delay you by a day and cost you several hundred dollars with no accommodations provided by the airline, or an overweight bag costs you several hundred dollars, etc. Cheap airlines are cheap for a reason, so I highly recommend using Google Flights to find the best flights and then book through the airline web site. Booking 3 to 6 months early is the best way to get a deal. Flights to Sarajevo are long, typically 18 to 26 hours, and have several legs. Most flights go through Germany, France, or Turkey can have long delays in customs, and they do search bags thoroughly, so plan flights with at least 2-hour layovers so you don't miss your connecting flight. It can take 30 minutes to get through security if your bags are searched. With shorter layovers, weather delays can cause you to miss your connecting flight which typically causes an overnight layover, delaying your arrival by a day. There are some important differences to note between American airports and others. European airports in Germany and France can be huge with few to no separate hubs, so your arriving flight can arrive at a gate literally a mile away from your next departure gate in the same building, and you have to walk the distance, with far fewer moving sidewalks and many more twists and turns, so you must have plenty of layover time and be diligent about reading directional signs which may not be as apparent as in American airports. Departing flights will wait a bit for late arriving passengers, but don't count on it, book flights with at least a 2-hour layover if you can. Most of the time when flights arrive in European airports, rather than de-planing via a jet bridge connected to the terminal, the plane parks on the tarmac away from the terminals and buses take passengers to the terminal. In this scenario, you can be dropped off a long distance from your next flight's gate, requiring a very long walk to your gate which can make you miss your connecting flight if your layover is short. So again, book 2- or 3-hour layovers if possible. Your overall flight will be longer, but your stress level will be much lower. The Istanbul, Turkey airport where many Bosnian flights pass through is one of the largest airports in the world and operates differently than American or European airports in the respect that flight boards do not have flight info more than about an hour or so before the flight leaves, and they are notorious for changing gates multiple times before departure. So if you arrive 2 or 3 hours before your next flight leaves at the far end of the airport and your departure gate is at the other far end of the airport, you won't know until an hour or so before the flight leaves. If you're not paying attention, you can miss your departing flight. I have had instances when my gate was changed 3 times while I was sitting at my gates, so PAY ATTENTION and watch the flight boards if in the Istanbul airport. To make matters worse, many of the smaller flight boards scattered around the airport will only have limited flight info, so it's best to go to the large central board at the center of the airport where the giant duty-free mall is. You also have to go through 3 or 4 security checkpoints at Istanbul, and they search your bags, so be prepared for that. The good news is, Turkish airlines and the airport have decent vegan Turkish food. It should go without saying, but don’t miss your flight! Get to the airport 2 or 3 hours early depending on how big and busy your local airport is. If you miss an international flight, especially to Bosnia, it could delay you a day or more. There are only a few flights to Sarajevo per day, and if they’re booked up, you could be waiting days to catch another. Absolutely make sure you know the airline baggage weight and size limits; if you go over, it will cost you hundreds of dollars in extra fees. Also when choosing seats on transatlantic flights, avoid seats near bulkheads, that's where bassinets for babies are attached to the wall, so you'll likely be subjected to 3 to 5 crying babies on the 8 to 10-hour flight. I have not been able to get wi-fi to work in several European airports and at Istanbul, and I’m a 40-year IT veteran, so don’t count on having wi-fi access when traveling. The Sarajevo airport does not have wi-fi, so you won’t have cell service, internet, email, or be able to communicate with anyone unless you have a working Bosnian SIM card already in your phone. Most everything in the airport is closed at night, so you can get stranded if you don’t have a working phone or rental car with a GPS. I am starting a service to sell working Bosnian and Croatian SIM cards by mail order and rent cell phones with Bosnian and Croatian SIM cards that will work when you arrive. See A Better Option Coming for Phone and GPS below for details. In general, Bosnia and Croatia have good high speed internet. Most hotels and Airbnb properties have decent wi-fi, but check with your host if it’s crucial to you. I have had some issues with Airbnb properties that claimed to have decent wi-fi but didn’t. The Sarajevo airport is tiny so it's easy to get through, but most rental car booths and the gift shop close around 8 pm, so if your flight comes in after that, there won't be much open if you need help. The rental car booths will stay open to a certain time if they know renters are on the evening flights, but you should confirm before leaving if your flight arrives after 7:30 pm or so. There is no place in the airport to get a cell phone SIM card, and the closest cell phone store (BH Telecom) closes at 5 pm (1 pm on Saturdays), so be ready with a GPS if you're not using a shuttle service or taxi. There is an ATM at the Sarajevo airport to get cash, but the ATM fee is significantly higher than elsewhere, so get just enough cash to hold you for a day and then go to local banks or currency exchange stores all around Sarajevo to get Bosnian marks (aka, BAM) to get cash at the lowest rate. Most banks will convert US dollars to BAM, and you can always use a bank ATM to get cash at the best rate. Currency exchange stores away from the main tourist drags will often have better rates than the banks. Credit cards are accepted in most places, but most credit card companies charge currency conversion fees. The fees are higher if you make the purchase in a foreign currency rather than Bosnian Marks (BAM) or Croatian Kuna (HRK), so specify the local currency when asked. It’s a good idea to get several days worth of cash from ATMs to minimize currency conversion fees. Using a credit card for every purchase will ring up a lot of conversion fees. One great way to avoid fees is to get a Chime prepaid debit card before you go. It has no conversion fees, and a $2.50 ATM transaction fee. You can transfer money into your Chime account with online banking when traveling as well. Be sure to notify your credit card companies of your travel destinations and dates before you go, including airports and stops along the way, so they won’t block your card when traveling. The Bosnian pyramid conference has shuttles to drive you to and from the airport and the various places they'll tour you around. There are buses and trains in Sarajevo, but it's a fairly small town so you can walk to most places in the downtown area. Taxis operate around Sarajevo, Visoko, and the airport, but you don’t want to take any that wait at the airport, pyramids, or tourist destinations, or you’ll get ripped off big time. Calling a taxi is problematic since dispatchers and drivers often don’t speak English, so it’s best to use the mojTaxi phone app to hail or schedule a taxi. Sarajevo Taxi and Crveni Taxi (Red Taxi) are the most reliable and use meters so you will get charged a standard reasonable rate. Most other taxis will haggle a fixed fee. If you have no other option than to use a nearby taxi, make sure it has a meter inside and confirm with the driver he’ll use the meter. Uber and Lyft do not yet operate in Bosnia, but there is a fairly new service called GoGo that operates like them. I have not used that service so I can’t vouch for it. Drivers may not speak English, so be sure to have Google translate working or the written name/address of your destination to show the driver. If you're going to travel anywhere away from the Bosnian pyramid conference area, or if you want to come and go as you please, you'll need a rental car. Even the big international rental car agencies at the Sarajevo airport are small and not well-funded, so the selection of cars and options is limited. It’s very common while you’re picking up your car to get a free “upgrade,” which is really a downgrade to whatever they have on the lot, so scrutinize the type of car carefully before you agree to any “upgrade.” I have booked sporty Volkswagens online and then been “upgraded” to crappy boxy Fiats with no power that were hard to shift, making it hard to navigate the common steep mountains roads or pass slow cars on two-lane roads. Very important: most rental cars in Europe are manual shift, not automatic, and you pay a premium to have an automatic, so be aware, your choices will be more limited and the cost will be higher with an automatic. So if you have time, it pays to learn how to drive a manual shift. Vehicles have steering wheels on the left side and drive on the right side of the road, just like in the US. Note also, European manual shift cars are geared differently than American cars since they often have to be able to slowly climb steep roads and alleys, so typically the first two gears on a European car are lower than American cars so shifting can take some getting used to for American drivers. I recommend checking prices on Hotwire.com to find deals on rental cars, but then book through the car rental agency web site to avoid double-paying for liability insurance at the airport. I have had some rental agencies make me pay an insurance fee even though I had already bought insurance through 3rd party booking sites like Hotwire.com and Kayak.com. Avoid Sixt and Europcar rental cars, they have the fewest selection of cars and shorter hours than others at the Sarajevo airport. Dollar/Thrifty, Avis, Alamo/National, are better, but selections don’t compare to what you’ll find in the US. Are Visas or Other Travel Documents Needed? Bosnia is not a member of the EU, and as of early 2019, a visa is not required for US citizens entering Bosnia and surrounding countries of Croatia, Montenegro, and Serbia, but that can always change, so always check passport and visa requirements with the US State Department. If you cross into neighboring countries like Croatia, Montenegro, or Serbia you will need your passport and special papers for rental cars provided by the rental agency when crossing border checkpoints. So be sure to tell the rental agency which countries you will be entering so they will have the correct paperwork. American citizens at the time of writing do not need visas for any of these countries, but again, always check with official government agencies for current info. For example, starting in January 2021, Americans will need to get pre-travel security screening before traveling to “Schengen Area” countries in the EU, and even before then, not all US residents and US citizens can enter Europe visa-free, due to their nationality and their situation, so always check official government agencies for your particular circumstances. Currently Croatia is a member of the EU, while Serbia and Montenegro are not, but none are part of the Schengen Area. Do You Need Insurance? YES! Both Kinds! Definitely get both full coverage rental car and trip insurance! There are MANY tiny alleys lined with cars and tight spaces all over Europe. Bosnia and Croatian towns often have very steep roads and narrow alleys that literally will only allow a few inches on each side of your car, so most certainly get insurance! European roads in general are not as wide as American roads. I have had a few close calls and I am a pretty good driver. Even if you’re the world’s greatest driver, others aren’t, and you may get hit while parked. Theft in Bosnia and Croatia are much lower than in more popular European tourist destinations like Paris or Rome, but you never know. Best to get rental car insurance from the car agency rather than a 3rd party like Hotwire.com, Kayak.com, etc. It will work better and cost less overall. Things can happen to delay or cancel your trip, such as accident, illness, flight delays, etc. So always get travel insurance, it’s not that expensive and well worth the peace of mind. I have gotten reasonably priced good coverage from Allianz Travel Insurance. If you're going to be traveling around the country, I recommend having two GPS's along, and download Google Maps to your phone. I have rented Garmin and other standalone GPS’s from rental car agencies and none of them worked, they’d go nuts and spin around, sending me many miles in the wrong direction. So don’t rely on rentals, bring your own Garmin. Bosnia's cell network is not that great, so I recommend taking a Garmin GPS with a map of Europe installed, as well as a GPS on your phone with maps downloaded to your phone for the areas you'll go. In my experience, sometimes one works better than the other depending on where you are; either can send you in circles at times, but generally Garmin is more reliable than Google, unless you're using downloaded maps. Garmin uses a radio signal to communicate with satellites so no cell service is needed, whereas cell phone GPS’s need both cellular service and radio satellite location services normally. However, you can use Google Maps or Here We Go GPS without having a working SIM card (local cell service) if you first download their maps to your phone, and they work quite well driving, but beware, they usually won’t work with walking GPS. I have used both iPhones and Android phones for cell service and GPS in southern Europe. In some cases GPS with Apple maps will work better than Google Maps, and vice versa at other times. Both work well with a local SIM card, but important, your phone must be unlocked to use a foreign SIM card! Nothing worse than getting to Bosnia and finding out your phone can’t accept a SIM card from a different cell carrier. If you don’t have an unlocked phone, read on, there are other options. I have also used mobile wi-fi hotspots like the Huawei E57585Lh-22c combined with my cell phone and no SIM card in the phone which worked well but creates massive EMF, and after 5 days of cross-country travel and walking GPS with that arrangement, I felt like I was going to have a heart attack. Add several wi-fi routers you’ll be exposed to living in apartments in cities and you’ll be exposed to dangerous levels of EMF. So I recommend turning off wi-fi in places you’ll stay and avoid bringing wi-fi hot spots. Instead get a local SIM card for your phone, use it away from your body, turn it off when not in use, and place an EMF protector on all your wireless devices and your body. Recently dual-SIM cell phones with two SIM card slots have come on the market. You can put SIM cards for the two countries you’ll be traveling in and the phone will work in either. They work well, but decent phones are quite pricey at this time. That will change over time, so keep an eye out. Another development may make SIM cards entirely obsolete, virtual SIM cards, software, and phones. The beauty of this is you install software on your existing unlocked phone that makes your phone think it has SIMs for every country on Earth. You just select the country you’re in on the phone and it will access local carriers and charge your credit card. From what I hear, these virtual options don’t always work well, so I wouldn’t rely on them until you’ve confirmed it will work in your situation. When traveling typically you’re exposed to massive electromagnetic fields (EMF). Airplanes now have on board wi-fi, hundreds of people with cell phones and other wireless devices on, avionics, and nuclear fallout in the atmosphere outside of the plane that radiates inside the plane. You’re basically inside a giant metal Faraday cage that reflects the radiation all around back at you. Add cell phones, GPS, and wi-fi when traveling to that exposure, and you have a recipe for illness. So avoid exposure to EMF as much as possible and use EMF protection on your body and devices. Use a cheap selfie stick if using walking GPS to keep the phone out of your hand and away from your body. This really helps with travel fatigue! My Rest Shield device is also superb for aiding sleep and EMF protection when staying in dwellings. The Rest Shield works on any regular power around the world, but you will need a plug adapter outside of the US. and if you go to Croatia, a Hrvatski Telekom (T-Mobile) SIM card. You need separate SIMs for each country, there are none for both. These are the largest and most reliable carriers in their respective countries. They're cheap, less than $20 typically for 2 weeks of use. While everyone tells you you can just pick them up at any news stand, it's not that simple in Bosnia. Once you install the SIM card, you have to change settings in your phone typically, and the only real way to get it done properly is to have a rep at a BH Telecom store do it for you. Between the language barrier and cryptic settings, you'll never get it right on your own. Then if you run out of minutes, you'll get texts in Bosnian with instructions on how to add more minutes, but if you don't have wi-fi, there's no Google translate so you won't know what's going on, and you will lose phone functionality. So it's important to get your phone set up at a BH Telecom store, and add plenty of minutes to last you for the time you'll be there. GPS eats up your allotted data, and the store reps don't take that into consideration when recommending the number of minutes to buy. SIM cards in Croatia are easy to use, just buy one at a news stand or Hrvatski Telekom store (all around), pop it into your phone, and it just works. I have rented and purchased international cell phones and SIM cards for use in various European countries including Bosnia, Croatia, and Montenegro. In every case, they sucked. Most rental phones require you to call the destination party and then hang up. The phone then calls the party and tells them with an automated voice to call you back. This can be confusing and often you won't get the call back. It's a stupid system that they don't reveal when renting a phone. Rental phones also usually don't have GPS installed, and you can't add it. If you rent a car, you MIGHT get GPS with it, but in Bosnia the rental car companies are so poor, their GPS's are cheap and don't work well. But I would not trust them in Bosnia. What If I Don’t Have an Unlocked Phone? You have two options, buy a cheap unlocked burner phone before you leave, or read on. If you want to buy a good inexpensive cell phone I recommend an unlocked Motorola Moto G4 Play with 128 GB micro SD memory card. That’s what I use and it works well, plenty of space for maps, photos, video, apps, etc. If you use a phone that doesn’t have plenty of storage, especially if you use downloaded maps, you may run out of space on your phone for pictures, video, and additional apps that you might need. I recommend a minimum of 64 GB of storage, but 128+ GB is better. However, there is another alternative. I was so frustrated with the lack of directions and support in English with these Bosnian SIM cards and European rental phones that I am creating a service to provide ready-to-go SIM cards and rental phones for Bosnia and Croatia. Additionally, these phones will come with our Harmonic Shield scalar energy EMF protection built in, greatly reducing the harmful effects of the cell phone microwave radiation. You won’t get that with any conventional solution. As of this posting date, I am in the process now of getting that set up and should have phones and SIM cards available by mid-April 2019. I don't have pricing yet but it will be less than other phone rental services. That way you can buy a working SIM card with setup instructions in English (or other languages) or rent a fully functional phone loaded with every app you could possibly need that will work as soon as you arrive in Bosnia or Croatia. That way when you arrive you can do GPS, internet, texting, etc. as soon as you get there. If you're renting a car, that's invaluable for not only GPS, but keeping in touch with whatever local contacts you need, like Airbnb hosts, shuttle drivers, hotels, etc. If you fly into Sarajevo you can just get in your rental car, engage reliable GPS, and go. If you’re interested this option, contact us at Fresh And Alive to be notified when it’s available. For texting and voice, Skype and other messenger apps have proven to be one of the most reliable ways to communicate with folks back home from your cell phone, as long as the recipient also has the app. Conventional SMS texting will only work in the country you have a SIM card for, so you can’t text people in the US with a Bosnian or Croatian SIM card. There are other messenger apps like WeChat and WhatsApp that also work well. But understand, these apps are spyware, so all of your communications will be spied upon by government agencies and others. But then again, most apps and cell phones themselves are spyware, including Skype. Skype works on phones and computers, but it must be open on computers to receive messages in real time. Making calls to a phone from Skype costs money and it’s not cheap, so for voice calls back home to non-Skype phones, I use another option. The cheapest and most reliable way to make voice calls back to US phones (landline or cell) that don’t have Skype or such installed is by using a wired phone connected to a VOIP phone adapter connected to a hard wired internet connection. Note, MagicJack doesn’t work with wi-fi. I use a mini corded travel phone connected to a MagicJack to make locals calls in the US. MagicJacks are reliable and much smaller than other VOIP phone adapters like Vonage or Ooma, etc. You connect the MagicJack to a wired internet connection and to a wired phone. Since you’re making calls over the internet, it doesn’t matter where in the world your Magicjack is physically located, the phone systems think it’s calling from the US. So you can make calls to US phones for free, and you can make dirt cheap calls to other countries if you pay for the international calling plan, which is also cheap. The MagicJack costs $35 per year which includes the hardware adapter. Airline apps- get the apps for whatever airlines you’ll be using. They won’t work unless you have wi-fi or cell service, but they can be very handy for checking in early and getting your boarding passes sent to your phone, etc. Even so, I highly recommend using paper boarding passes, just in case your phone doesn’t work. Skype- for texting and calling. There are several different version with different capabilities and costs. FullContact- fantastic cloud-based contact manager. Allows you to access your contacts from any device easily, and you won’t lose them if your phone is lost. Tripit- a super fantastic app/web site that saves a huge amount of time creating your trip itinerary, and it notifies you by text of flight changes, etc. usually before the airlines will. You set up a free account online, then forward confirmation emails from your accommodations, flights, rental cars, conferences, etc. to Tripit and it will automatically create an itinerary in time and date order. You can customize the itinerary as needed, but this saves me hours off putting together my trip itinerary. A must have app! Airbnb- if you’re staying at Airbnb properties, this makes it much easier to stay in communication with hosts. Chime- if you’re using a Chime prepaid Visa, this allows you to easily add funds. AAA- if you’re a AAA member, helps you get discounts on all sorts of stuff. Generally Bosnia and Croatia are very safe, there's very little crime, even in Sarajevo. It can be safer in a bigger city like Sarajevo at night than in the countryside or small villages since there are many more people out and about. You don't have so many pickpockets and thieves as in northern European tourist traps like Paris, Rome, etc. Still, keep your wits about you, don't do things you wouldn't do in any big American city. Thanks to poverty and lingering trauma from the wars in Bosnia in which most people had family and friends killed, many people do not smile and some may seem unfriendly, especially those who deal with tourists regularly. It's not personal. Those too young to remember the war are generally more friendly and gregarious. Generally it’s bad form to bring up the war unless a local person does so first. Bosnia is mostly a muslim country, so you will see Mosques and minarets all around. Mosques broadcast prayers on loud speakers several times a day, even in the middle of the night. People generally are more religious than in the states, so be aware to avoid any faux pas. Remember, you're in a developing European country, not your home town, so expect the unexpected and go with the flow. You may find your accommodations not so accommodating. You may find food, phones, internet, GPS, communications, transportation, not so ideal at times. You may find the widespread smoking very annoying. But generally people are very kind to visitors and a few phrases in Bosnian like "please" and "thank you," go a long way. Be a good ambassador of American culture. Many people in the larger towns and tourist areas like Sarajevo, Split, Zagreb, Zadar, Dubrovnik, etc. speak some English. But away from those more touristy areas, most people do not speak English, so a working cell phone with Google translate makes life MUCH easier when traveling. While you don't have to dress fancy, generally Europeans dress more nicely than Americans, so you may want to avoid typical American dress to avoid sticking out like the ugly American tourist. Baseball caps, especially on backwards, t-shirts and tank shirts, especially with American slogans on them, flip flops, sweat pants, college sweatshirts, all scream "I'm a typical American tourist." Don’t be that person. In the Ravne tunnels at the pyramid sites, it can be in the 50s Fahrenheit while it's in the 80s or 90s outside, so wear long pants and bring a jacket that can be easily removed. It can also get muddy inside the tunnels and it's easy to brush up against the muddy walls in places, so wear shoes and clothes that can be easily washed. In the summer especially, it can rain at any time, so bring an umbrella with you. Some folks say don’t pack an umbrella, you can buy a cheap one at your destination. True, but it can be a pain to find one in unfamiliar territory, so I bring a good collapsing umbrella and/or a rain poncho depending on whether I’m roughing it or not. Temperatures between day and night can vary enough that it can feel cold at night in some places like the mountains or at Plitvice Lakes, so bring short clothes and long pants and some warm clothes even in summer. Most places don’t have air conditioning, but they don’t really need it since the stone and masonry buildings stay fairly cool during the summer days. So if you made it this far, enjoy your trip and maybe I’ll see you there! Below are some recent shows. Is cacao (chocolate) really a superfood? Juicing- is it good or bad? EMF pendants and cell phone protectors- how they work, which ones are good? Do shungite or carbon 60 promote the development of nano particles in the body? Can EMF Cause Heart Problems? Ken Rohla discusses how cell phones and excessive exposure to wireless technologies can have adverse effects on your health that you might not realize. Ken Rohla explains how to use scalar energy to improve fermentation and enhance nutrient levels. I did an online presentation in March, 2018 at the Truth in Cancer Summit on cellular regeneration using nutrition, detoxification, emotional healing, and reprogramming limiting or self-destructive beliefs. The event was hosted by Neil Gaur of PortaltoAscension.org. In this free presentation, I covered my methods for healing that can be applied to any degenerative disease, techniques that I used with a high degree of success for many years with individual clients (I no longer have time to do individual consultations). In this presentation I cover what cancer is, how it is caused, and what solutions are available to assist in healing it naturally. Other esteemed presenters in the summit include Dr. Stephen E West, and David Sereda, and Dr. Thomas Lodi, all cutting-edge healers with brilliant solutions for disease. Fresh And Alive president, Ken Rohla, interviews Sara Banta, owner of Accelerated Health Products. Sara discusses how she healed herself and her family of health issues arising from consumption of the standard American diet: GMOs, processed food, microwaved food, refined carbohydrates, sugar, etc. Sara covers the importance of detoxification, nutrition, restoring intestinal health, and breaking food addictions. Dr. Semir Osmanagić's full 2-1/2 hour presentation on the Bosnian pyramids and pyramid energy around the world, presented in New Smyrna Beach, Florida, USA in January, 2018. Dr. Osmanagić covers the latest discoveries at the pyramid complex, a group of pyramids and other structures he discovered in 2005 in Visoko, Bosnia-Herzegovina outside of Sarajevo. The Bosnian pyramids are the largest discovered in the world so far, and scientific analysis is indicating our assumptions about human history must be reconsidered. Dr. Osmanagić covers pyramid and megalith discoveries around the world, what archeological and scientific analysis is showing about the Bosnian pyramid complex structures, and properties of the pyramids for healing, purifying water and air, improving meditation and consciousness, and more. Dr. Osmanagić explains why the archeological professional organizations and other archeologists with profit motives have sought to not only dismiss the Bosnian pyramids, but to discredit him as well. Bosnian archeologist Dr. Semir "Sam" Osmanagić and scalar energy technology developer Ken Rohla discuss pyramids around the world and the latest discoveries with the Bosnian pyramid complex, a group of pyramids and other structures Dr. Osmanagić discovered in 2005 in Visoko, Bosnia-Herzegovina outside of Sarajevo. The Bosnian pyramids are the largest discovered in the world so far, and scientific analysis is indicating our assumptions about human history must be reconsidered. Dr. Osmanagić covers pyramid and megalith discoveries around the world, what archeological and scientific analysis is showing about the Bosnian pyramid complex structures, and properties of the pyramids for healing, purifying water and air, improving meditation and consciousness, and more. Ken Rohla discusses the physics of pyramid energy, aka scalar energy, as it relates to the pyramids and structures, and how a lack of understanding of scalar physics contributes to the contention by the archeology orthodoxy that the pyramids are natural formations, not constructed objects. Lymphologist Dr. Stephen Ezra West of zerodisease.com discusses with Ken Rohla of freshandalive.com, fast, powerful, and simple healing techniques by working on the lymphatic system and using energy techniques. Dr. West explains the relationship between the immune system, the lymphatic system, and the blood system. Dr. West and his Nobel-nominated father, Dr. C. Samuel West, have pioneered understanding the lymph system and it's relationship to health and healing. Dr. Samuel West discovered the existence of lymph vessels in the brain decades ago, which was refuted by mainstream medicine until recently when the mainstream finally caught up. Understanding these fundamentals of how the body works yields amazing results in healing and preventing disease and acute injuries. Ken Rohla interviews Charles Bohdy, founder of Bio Blaster commercial ozone generators, about affordable nontoxic mold and mildew removal using commercial grade shock ozone treatment. Charles discusses the science of mold and mildew removal from buildings, carpet, and vehicles; odor elimination; water purification; insect control; detoxifying/ disinfecting fruit and vegetables; and elimination of off-gassing of new materials in new buildings. Chemical sensitive people, take note, ozone can help reduce or eliminate off-gassing of toxic materials in new homes! Charles also notes the lack of knowledge and quality control in the mold removal industry. Buyer beware! Ken Rohla answers questions about how to brew and use Effective Microorganisms (EM) probiotics, how the Aamoraa and Pong cell phone case electromagnetic field (EMF) protection devices work together, water purification and the importance of angstrom and monatomic (ORMUS) minerals. To find a live blood cell microscopist, see http://www.phmiracleliving.com/t-Microscopist-List.aspx . Ken Rohla answers questions about "smart" power meters and protection from electromagnetic fields (EMF), whether scalar energy devices interfere with the natural flow of scalar waves from the environment, when fasting is recommended and when not, and more. Comprehensive Korean study shows cell phone research is widely biased. Who is funding the studies that say EMF pollution is not harmful?